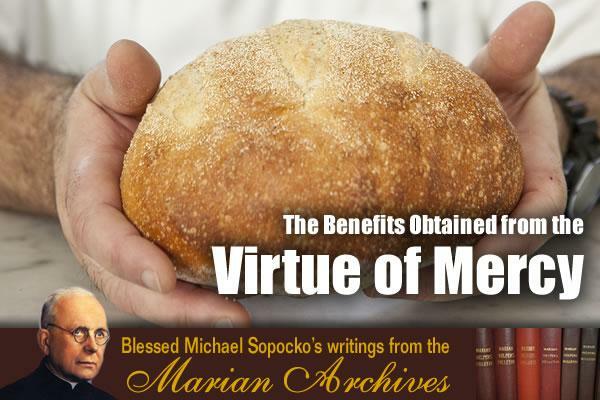 The following article by Blessed Michael Sopocko was first published in the January-March 1963 issue of the Marian Helpers Bulletin. Blessed Michael was the confessor and spiritual director of St. Faustina. There is no virtue to which Holy Scripture assures a greater reward than to those who practice the virtue of mercy. If God rewards all virtues, then He rewards doubly the virtue of mercy with both temporal and eternal goods. Innumerable passages of Holy Scripture give evidence of rewards prepared for us, in exchange for our merciful deeds to our brethren. "Befriend the poor, and lend to the Lord; he will repay faithfully" (Prov 19:17). "For every loaf of bread given to the hungry, blessing shall be the reward of kindly hearts," (Prov 22:9). "Give to the poor and take nothing back; turn away from their plea, and blessing thou shalt have none," (Prov 28:27). Further, the Prophet eloquently writes about this when he says: "Share thy bread with the hungry, give the poor and the vagrant a welcome to thy house, meet thou the naked, clothe him; from thy own flesh and blood turn not away. Then sudden as the dawn; the welcome light shall break on thee, in a moment they health shall find a new spring, divine favor shall lead thee on thy journey" (Is 58:7-8). Our Lord promises many great blessings and graces for the merciful when He says, "Give, and it shall be given to you…; the measure you give to others is the measure that will be given to you" (Lk 6:38). "Do them good and lend to them, without any hope of return; then your reward will be a rich one, and you will be true sons of the Most High, generous like Him toward the thankless and unjust" (Lk 6:35). This, therefore, is the greatest reward a person can expect. We become sons of the Most High for being merciful to our fellowmen. We can boldly call God our Father since we come with aid to His children and our brothers. Holy Writ gives us a few concrete examples as to how God rewards the merciful even in this earthly life. The home of Job was truly a paradise of the earthly prosperity until the Lord God visited it with trials. He merited for himself such generous blessings because he was merciful to his fellowmen. Job says to himself, "In me, the blind found sight, the lame strength, the poor a father. None heard the fame of me then, but called me a happy man; none watched my doings then, but spoke in my praise. Poor man nor helpless orphan cried to me in vain; how they blessed me, souls reprieved from instant peril; with what comfort the widows heart rejoiced!" (Job 29:15-16; 11-13). Likewise, when Elias, during the time of famine, lived at a poor widow's home, she gave him the last handful of flour and the remainder of the oil that she had and God repaid her in a miraculous way: "Fear not…" said Elias, "and this was said by the Lord God of Israel: There shall be no lack of flour in the jar, nor shall the oil waste in the cruet, till the Lord sends rain on this parched earth. And from that day onwards there was still flour in the jar, still oil in the cruet, as the Lord's message through Elias has promised her." (1 Kings 17: 13, 16). Who does not know of the great reward the merciful Tobias merited for himself, to whom the Archangel Raphael said: "Prayer, fasting, and alms, here is better treasure to lay up than any store of gold. Almsgiving is death's avoiding, is guilt's atoning, is the winning of mercy and of life eternal" (Job 12:8-9). God, therefore, abundantly rewards merciful deeds done to our fellowmen with various temporal goods. The rewards for mercy do not end at temporal goods, but a hundred times more valuable are the spiritual goods with which God rewards this virtue, and these goods are summed up in one word forgiveness and grace before God. This is the greatest good, the most valuable treasure, the pearl of great price which can easily be found by the practice of mercy toward our fellowmen. If anyone has had the misfortune of weakening his faith within himself and is wandering as a blind person, let him be merciful and he shall undoubtedly find himself upon that road of lost heavenly light. If, furthermore, he does not yet come to knowledge of the mercy of God and for this reason cannot imitate Him, then let him begin to practice mercy toward his fellowmen and assuredly the words of the Lord shall be fulfilled upon him; "Blessed are the merciful for they shall obtain mercy" (Mt 5:7). Cornelius, who was a captain in the Roman armies and a pagan merited for himself the grace of conversion to the faith through his merciful deeds. "…thy prayers and almsdeeds are recorded on high in God's sight," said an angel to him (Acts 10:4-5). In the same way the Lord made it known to Peter that he should baptize Cornelius and his whole family. Although the first grace of conversion cannot be merited because it is an act of the infinite mercy of God. But, if someone burdens himself with debts to God, and is in need of the special grace of forgiveness for the cleansing of his sins and for regaining his lost graces of sanctity, he assuredly will obtain these graces by practice of mercy towards his fellowmen. "Use they wealth in giving of alms; never turn thy back on any man who is in need, and the Lord in thy own need, will have eyes for thee." (Job 4:7). Thus the virtue of mercy obtains for us graces and light, cleanses us from our sins, guides us to the Sacrament of Penance, and saves our soul from death, that is from eternal damnation as is stated in Sacred Scripture," … Alms-deeds were ever a sovereign way of escape from guilt and death, a bar against the soul's passage into darkness, (Job 4:11), "Almsgiving … is guilt's atoning, it is the winning of mercy and of life eternal" (Job 12:9). For this reason Fr. Skarga, S.J., in his sermon on the 4th Sunday of Lent calls out "Almsgiving is as well-water, which if not stirred up, nor drawn from, it spoils in a short time, and when one draws water from it, other water flows into the well and it cannot be separated. Truly he who he who does not give to the poor from his abundance, will lose everything; but he who gives, loses nothing because from the gifts of God he receives more abundantly." St. Chrysostom calls mercy the companion of God that holds the keys of the heavenly treasury and gives abundantly to the merciful. Besides these temporal and spiritual goods received during this life, the virtue of mercy also brings an immortal reward. Our Savior assures us of this reward when He speaks about the sentence that will be given at the last judgement: "Come, blessed of my Father, take possession of the Kingdom which has been prepared for you since the foundation of the world. For I was hungry, and you gave me food, thirst, and you gave me drink. I was a stranger and you brought me home, naked and you clothed me, sick, and you cared for me, a prisoner and you came to me… When you did it for one these the least of my brethren, you did it to me" (Mt 25:34-40). And for this same reason St. Augustine says: "If you wish to be a prudent merchant and a wise steward, give that which you cannot keep, and you will take that which you will never lose; give a small portion, and you will get back a hundred-fold; give temporal things, and receive eternal goods in exchange." For more information about Blessed Sopocko, please visit thedivinemercy.org/sopocko.